The Merced River is the southern-most extent in the Central Valley of self-sustaining populations of anadromous fish, primarily fall-run Chinook salmon (Oncorhynchus tshawytscha) and winter-run steelhead (Oncorhynchus mykiss). After adults spawn and juveniles hatch from eggs within the gravel nests (redds), juvenile Chinook salmon migrate to the ocean that spring while steelhead spend one to two years rearing in the river prior to outmigration. Adequate stream flow and cool water temperature are key to survival for both juvenile Chinook salmon and steelhead during outmigration during the spring and for juvenile steelhead rearing during the summer and fall. Water years 2013 and 2014 (October 1 of a year through September 30 of the following year) were two of the driest years on record in California (DWR, 2014). California declared a state of emergency due to the long-term drought and established water conservation and monitoring measures. The drought conditions raised concerns for the loss of steelhead during the summer in the upper reaches of the anadromous section of the Merced River. CDFW staff deployed multiple water temperature recording probes approximately every four miles from Crocker-Huffman Dam to Hwy 59, a distance of 12 miles, although the focus was from G St to the Dam. The probes recorded river temperature every hour and were downloaded every day during most of the survey period. 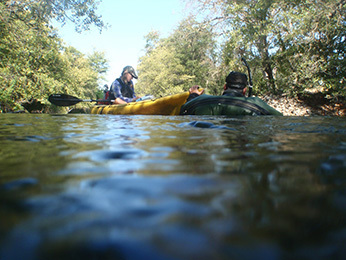 Beginning March 5, 2014 crews snorkeled sections in the upper river to count fish (all species). The area in the 10 river miles immediately below the dam was subdivided into 4 sections (Figure 1). A crew of four to five performed the snorkeling while one person managed data and supplies in a kayak (Figure 2A and B). A complete snorkeling survey was performed twice per month (usually every two weeks) although Section #4 (the furthest downstream) was surveyed during only five of the 15 survey periods. There were a total of 15 survey periods. Figure 3 shows the average temperatures at three locations from the top of the survey sections at Merced Hatchery (MRH) to Snelling Road bridge (G Street). The bars in the figure represent the counts of steelhead in Sections #1, #2 and #3. Section #4 had lower counts and was surveyed in only five survey periods. 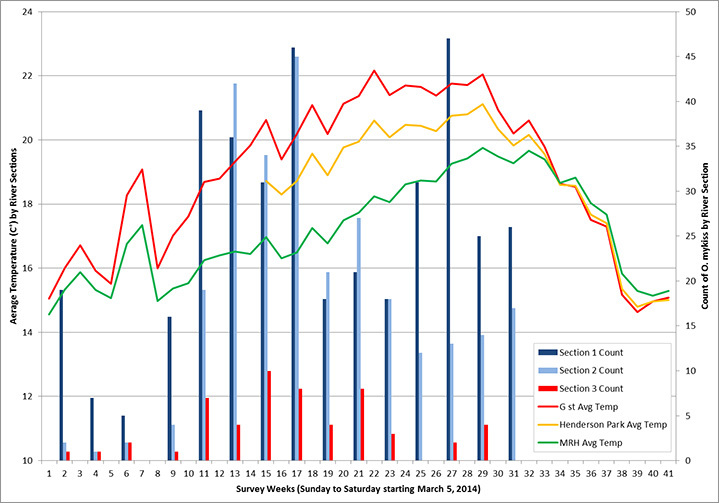 Fish counts in the sections increased as the temperature rose in the early weeks of the survey (Figures 4A and B). 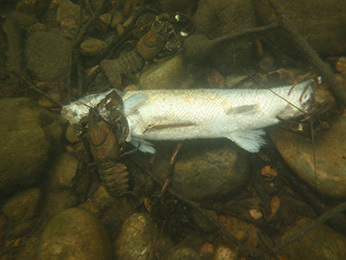 This is thought to be a result of fish moving from warmer areas located downstream to cooler temperatures upstream. Also, fish activity is greater at higher temperatures. The cumulative count of steelhead (over the 15 survey periods) was 738, with 365 (essentially 50%) estimated to be between 12 and 18 inches in length and 89 (>10%) estimated to be larger than 18 inches. Concern by CDFW fishery managers regarding the rising temperatures resulted in a decision to rescue steelhead from the Merced River. CDFW captured steelhead from July 11 (week 19) to September 10 (week 28) and held them in refrigerated recirculating tanks at the Merced River Hatchery. A total of 61 fish were rescued from the river and are currently still being held at the Merced River Hatchery (2014 Rescue Summary). 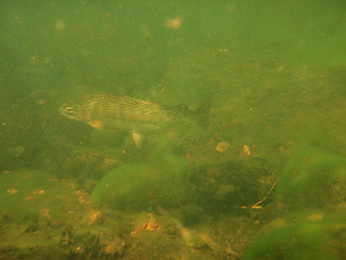 There was a substantial drop in the numbers of steelhead observed during snorkeling surveys in the initial weeks of the rescue. Following that decline, there was a general increase in the numbers within Section #1 over most of the rest of the rescue period. Steelhead are likely to continue to be a focus for restoration in the Merced River. Continuing snorkeling in subsequent years and for a longer portion of the river would allow a better understanding of the abundance and distribution of steelhead in the Merced River, particularly in response to high temperatures. This understanding would allow CDFW to act more effectively in restoring the steelhead population in this river. Ability to continue this work will be dependent on future funding. Figure 3. 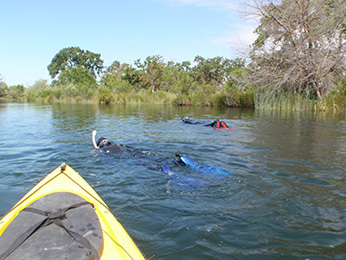 Snorkel survey steelhead counts and temperature results in the Merced River during spring and summer of 2014. CDWR, 2014. Breaking Drought News. WRCC climate region dry years, ranked by inches of precipitation Access May 06, 2014.